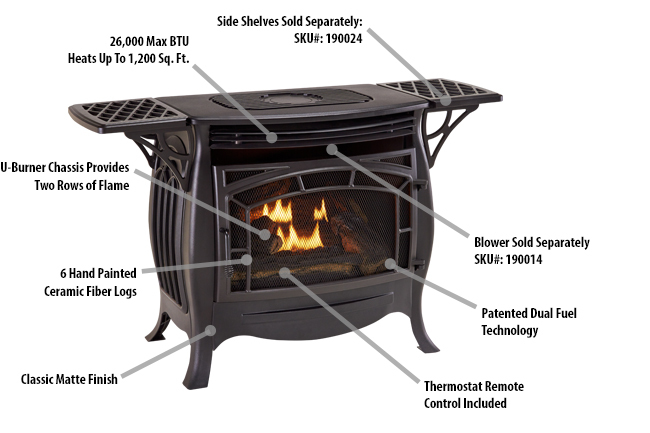 The Kingston Ventless Gas Stove by Duluth Forge gives you the perfect combination of beauty and high tech heating performance. This Vent Free Gas Stove holds onto the look and feel of a classical, vintage piece of old charm while fulfilling a solid performance of 26,000 BTU and includes a Thermostatic Remote Control. This trendy Heating Appliance will heat up to 1,200 square feet and become a staple for any home. It includes a cast iron screen door with subtle exterior designs that allows for excellent visibility of the dual flame burner. Although it has the charm of an old timer, it functions with reliable modern technology. Side Shelves Sold Separately. Stove Dimensions (HxWxD): 26.125" × 28" × 16.875"
Carton Dimensions (HxWxD): 31.125" × 31.375" × 20.5"